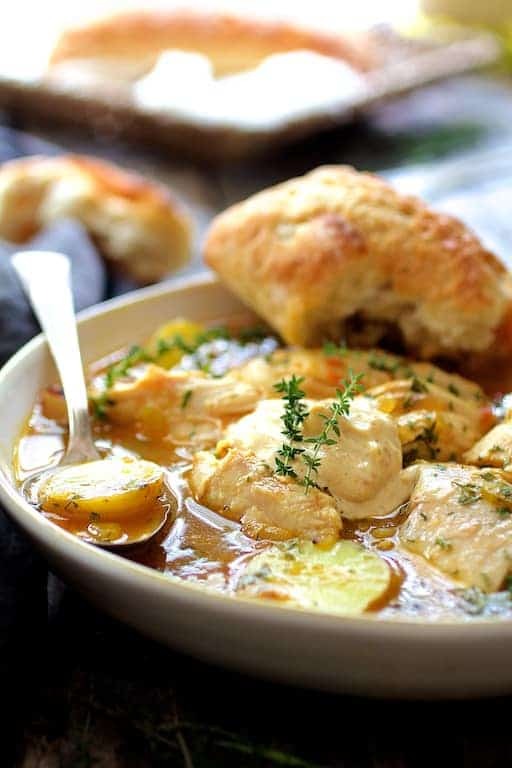 Lush and luxurious, French-inspired Chicken Bouillabaisse is a rustic chicken stew that’s elegant enough to serve to guests! So, it’s not cooling off here as quickly as I’d like. It’s November and the temperature is still in the high 80’s. It’s rather strange trying to find “light” food this time of year when you’re craving something hearty and comforting and you’d rather be snuggling into fleece after a long day instead of shorts. 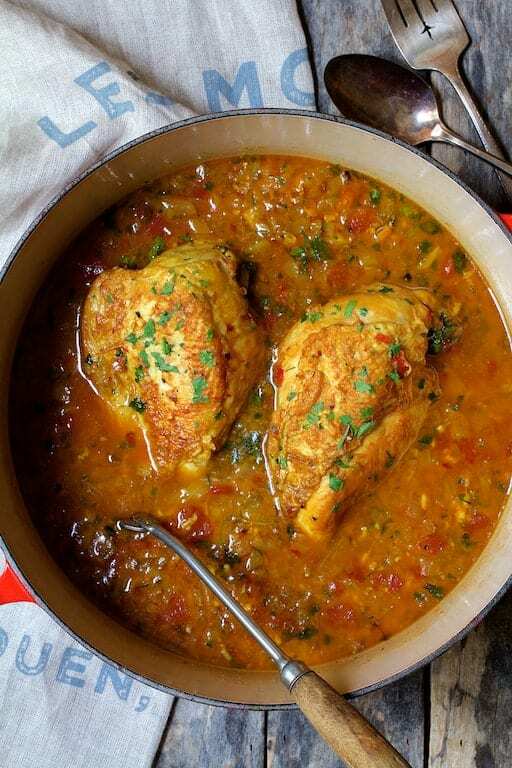 I am passionate about classic French-inspired chicken dishes and Chicken Bouillabaisse is the perfect “light” comfort food. If you’ve never made Chicken Bouillabaisse (Bouillabaisse de Poulet) before, you’re going to wonder why you haven’t! No doubt you’ve heard of the seafood version of bouillabaisse which is Marseille’s signature dish. The seafood version is typically prepared for a large number of people with a minimum of three different types of seafood. Because of the seafood, it can be pricey. The flavorings of the classic seafood version work well with budget-friendly chicken and it’s less fussy to prepare. This version is inspired by Julia Child’s recipe in Mastering the Art of French Cooking, Volume #2. Oh, Julia, where would we all be without you? I had the amazing opportunity to meet Julia Child twice and I cherish those memories. Both were at book signings. The first time, I was so starstruck at her presence I couldn’t even speak. The second time, I mustered up the courage to tell her I made her puff pastry from The Way to Cook—step by laborious step. However, it was SOME beautiful puff pastry! Miss you, Julia, but your culinary influence lives on in all of us. A bouillabaisse is always served with a rouille, which translates to “rust” because of the color. It’s a thick, garlicky sauce that often includes breadcrumbs and some type of chili pepper. However, there does not seem to be a definitive recipe from what I’ve been able to find. The one included here is from Saveur.com which is easy and tasty. Throw in some buttery Yukon Gold potatoes toward the end. Crusty bread to soak up the rich, luxurious broth is also a must! Your chicken soup life will never be the same again! 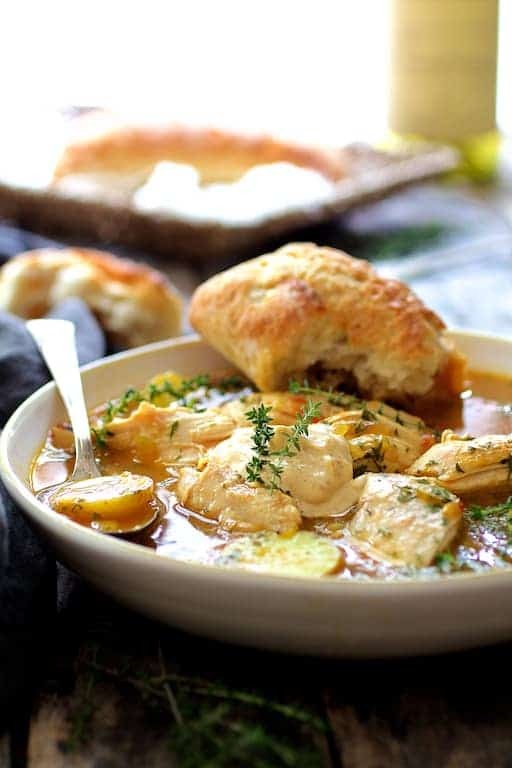 Lush and luxurious, Chicken Bouillabaisse is a chicken stew that’s elegant enough to serve to guests! It’s been a while since I was looking for a good chicken stew. I finally found it! Does it have to be wine to use, can I substitute it with water? Hi, Agness, Great question! Yes, you could just use water or broth. You could also add a little apple cider vinegar and lemon juice to it for an even better non-alcoholic wine substitute. Thanks again and hope you enjoy! This sounds lovely. Back in the day, a chicken breast meant both halves of the breast of a single chicken. These days the definition seems more fluid. Does this recipe call for the breast of a single chicken or the breasts of 2 birds? Hi, Jennifer! Thanks for your great question. I used one whole breast of a single chicken or two halves. Thanks again and let me know how it worked for you. 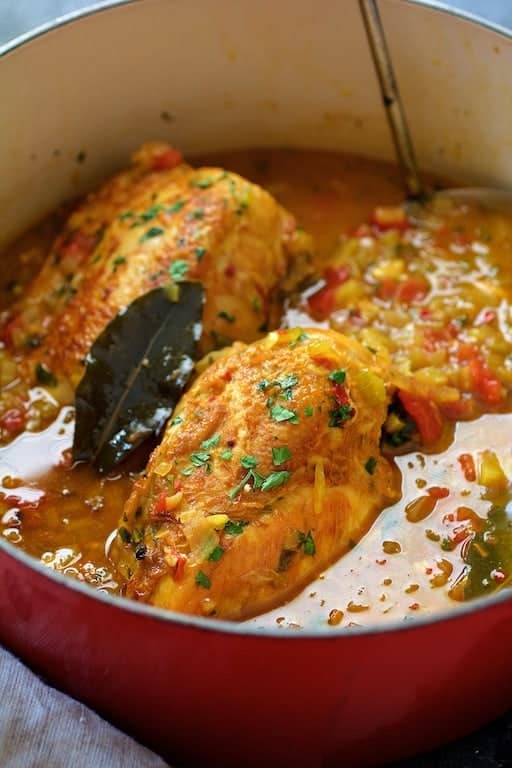 Chicken and fennel stew, nothing to do with bouillabaisse, fish is fish not chicken stew. Hey, Eutraveller, Yes, I’m certainly aware that bouillabaisse is traditionally made with fish. I’ve made it for my personal chef clients and one said my version was better than what she had in Marseilles. Even Julia Child (whose recipe for chicken bouillabaisse this is based on) had a little fun with the traditional dish. 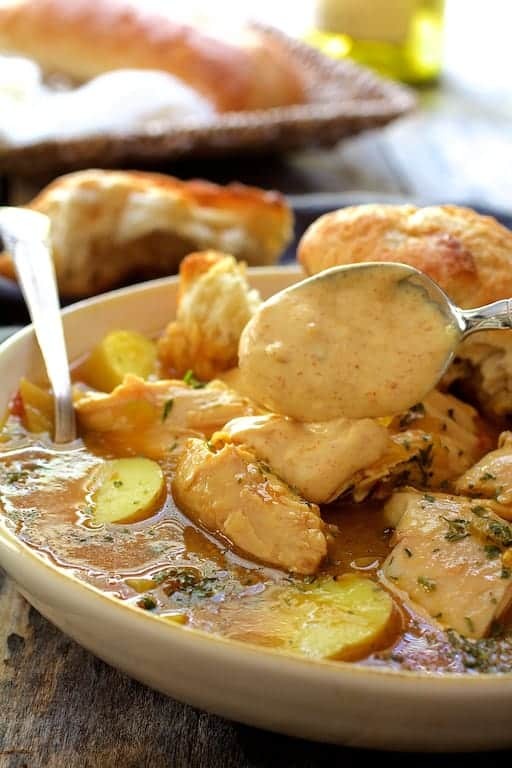 Jacques Pepin, who is a world-renowned chef of French origin, also has a version of “chicken bouillabaisse.” Love that these two famous chefs thought outside the box! Thanks for your comment!